Gavin Patterson, Chief Executive, commenting on the results, said “Our first half results are in line with our expectations as encouraging results in our consumer facing lines of business, notably EE, helped offset ongoing challenges in our enterprise divisions, in particular Global Services. Given our underlying business performance, we are maintaining our outlook for the year. “As the UK’s leading converged telecommunications provider we continue to make positive progress on all our strategic priorities. Improving customer experience is critical to our success and we have seen continued positive progress underpinned by investments in operational improvements, increased network quality and customer-centric product development. Our integration and restructuring programmes are also on track to deliver run-rate savings of £250m and £150m respectively by the end of this year. We are working closely with the UK Government, Ofcom and our Communications Provider partners to find the right solutions to accelerate the deployment of fibre and our universal broadband commitment. We are committed to delivering ultrafast speeds to 12 million premises by the end of 2020. Reconciliations to the most directly comparable IFRS measures are in Additional Information on pages 35 to 37. Our commentary focuses on the trading results on an adjusted basis. Unless otherwise stated in the commentary, revenue, operating costs, earnings before interest, tax, depreciation and amortisation (EBITDA), operating profit, profit before tax, net finance expense, earnings per share (EPS) and normalised free cash flow are measured before specific items. Further information is provided in note 1 on page 35. Our second quarter has seen a decline in reported revenue of 1% to £5,949m driven mainly by challenges in our enterprise businesses, partially offset by the strong performance in EE. In Global Services our revenue declined 10% due to ongoing challenging market conditions and also lower IP Exchange volumes and equipment sales in line with our strategy to reduce low margin business. Our main measure of the group’s revenue trend, underlying1 revenue excluding transit, was down 1.5%. Adjusted1 EBITDA of £1,811m was down 4% reflecting investment in sports rights and customer experience, along with higher pension costs, business rates and decline in Global Services partly offset our cost savings. Reported profit before tax for the second quarter was down 1% at £666m. Net cash inflow from operating activities was down £464m at £1,270m. Normalised free cash flow1 was £689m, down 23% mainly as a result of working capital phasing and higher capital expenditure. Our strategy emphasises the importance of customer experience in driving growth. Delivering a consistent and reliable service is central to customer experience and we have seen continued improvement in our Right First Time2 performance, increasing by 2.3% compared to the 2016/17 baseline. Our customers’ overall perception of BT continues to improve, with Group NPS3 increasing by 3.8 points over the same period. Our progressive growth in customer experience is underpinned by investing in operational improvements, increased network quality and customer-centric product development. Operational improvements have led to EE recording its lowest ever level of customer complaints, and joint lowest for mobile network operators, as reported by Ofcom in its latest report, down 25% year on year. We unveiled four new EE ‘Showcase’ stores in London and Nottingham to offer a more personal and immersive experience. Within BT Consumer, while further improvement is needed, we are pleased to see that Ofcom’s complaints data shows a reduction of 25% for landlines and 18% for broadband when compared to the previous quarter. Our focus on improving network quality has led to copper network fault volumes being 2% lower than the first half of last year, continuing the recent reversal of the long term trend of rising fault levels. When our customers do experience problems with our network, we have maintained a consistently high level of on-time repair performance of over 80%. Use of our digital channels continues to grow with the My EE app now beyond 10m downloads. We have developed and launched a new Business App to help customers manage their BT Business account. And we have launched the new BT TV app which is free to all BT TV customers, with many great features including access to BT TV premium channels and allowing customers to set recordings on the move. Our investment in 4G continues, with our geographic coverage now reaching 86% of the UK’s landmass. We have announced that we will upgrade more than 600 sites by the end of our financial year through converting 2G spectrum to provide airwaves into superfast 4G speeds. The sites will power the next wave of mobile devices to hit the UK market, doubling the data upload speeds from the current maximum of 50Mbps to up to 100Mbps on more than 900 sites across the UK. On 11 July, Ofcom issued its decisions on competition issues for the forthcoming auction of spectrum in the 2.3GHz and 3.4GHz bands. As a consequence of Ofcom’s proposed caps on the amount of spectrum any one operator can buy, we would not be able to bid for spectrum in the 2.3GHz band, and would be restricted to no more than 85MHz in the 3.4GHz band. As a result of Three’s challenge to the proposals, we also made the difficult decision to challenge the proposals and expect a court hearing in December. Our mobile base is now 29.7m. We added 279,000 postpaid mobile customers, taking the postpaid customer base to 17.3m. The number of prepaid customers reduced by 260,000, in line with industry trends, taking the base to 6.3m. Our 4G customer base reached 19.4m. We made a voluntary offer to deliver the Government’s goal for universal broadband access at a minimum speed of 10Mbps. This would involve us investing an estimated £450m to £600m depending on the final technology solution and aims to ensure that all UK premises can get faster broadband, even in the hardest to reach parts of the UK. The Government is now considering our offer alongside a consultation on the regulatory Universal Service Obligation. Openreach demonstrating that it can build FTTP at scale for a competitive cost. Openreach is considering all options carefully and will then invite views from CPs on a more specific set of proposals that cover potential pricing, footprint and a plan for FTTP switchover, by the end of the year. Openreach continues to welcome discussions with CPs on co-investment, risk sharing and network architecture approaches and will continue to engage with Ofcom and Government to build an environment that both encourages and facilitates investment. Further details can be found in Openreach’s press release dated 31 October 2017. We have passed 27.1m properties with our superfast fibre broadband network. We achieved 505,000 fibre broadband net connections, and service providers other than BT accounted for 65% of these. This brings the number of homes and businesses connected to around 8.6m, 32% of those passed. Our current plan is to make ultrafast broadband available to 12m homes and businesses by the end of 2020. We have announced a further 26 UK locations to pilot G.fast taking the total number of pilot locations to 46 and we are expecting G.fast to reach a million premises by the end of 2017/18. Our ultrafast broadband technology, using our FTTP and G.fast network, is now available to around 770,000 homes and businesses. The UK broadband market1 grew by 64,000, of which our retail share was 34%. Our retail fibre broadband additions increased by 179,000 taking our base to 5.3m; 57% of our retail customers are now on fibre. We are also planning for all-IP. We intend to move solely to all-IP product solutions by 2025. All-IP brings significant benefits to our customers, such as single order fibre products, real time provision, and digital line quality and we are already seeing strong demand for such products in our enterprise markets. During the quarter, we began streaming our weekly rugby union magazine show, Rugby Tonight, for free on social media platforms. In addition, BT Sport Score, the football results show, is now available to anyone using Twitter in the UK. These initiatives provide potential subscribers with the opportunity to sample our programming and underline our commitment to make televised sport more accessible to fans. Our TV customer base continues to grow with TV net adds of 7,000 taking our base to 1.8m and we introduced a charge for BT Sport for BT TV customers. Average viewing figures for BT Sport for the quarter increased 8% compared to last year (excluding showcase), driven by strong performance in both Premier League (up 2%) and UEFA Champions League (up 16%), with six British teams having qualified for the group stage for the first time since the 2007/08 season. We continue to make good progress with our EE integration. At the end of the first year we had achieved run rate savings of £150m. Progress in the first half of this year has raised the run rate savings to £250m and we remain confident that we will achieve our stated objective of £400m by the end of the fourth year. Savings have been generated from renegotiating supplier terms, insourcing a range of activities EE previously had with third parties across technology and business services, rationalising our combined property estate and reducing head office and support employees. These will continue with the creation of a single consumer line of business from April next year. The management teams for our BT Consumer and EE divisions have come together to develop the integration plans for the combined business.The two businesses will report separately for the rest of this financial year. Our restructuring programmes, focussed principally in Global Services, TSO and our Group Functions, are also on track. We have incurred costs of £104m in the half year (£52m in the quarter), removing over 1,500 roles mainly from managerial and back office areas. Across the Group we expect to remove a further 1,500 roles in the second half of the year. In total our restructuring programmes will generate savings of £150m this year. We continue to expect these programmes to cost £300m, with a further 1,000 roles to be removed next year, and for these programmes to have a payback period of two years and to achieve annualised savings of £300m when complete. In Group Functions, for example we have created a new ‘customer and enterprise transformation unit’, bringing together our Group Customer Experience, Group Transformation and major programme delivery teams to create a new team focused on ensuring our major restructuring and investment programmes have aligned cost transformation and customer service objectives. Separately, we have created a new Group Business Services unit bringing together previously disparate shared service activity. This new unit will aim to sustainably reduce the unit costs of our back office activities through leveraging economies of scale and simplifying processes. We continue to work on repositioning Global Services as a more focused digital business. Our aim is to shape Global Services so that it can deliver a global, scalable portfolio of our products and services from cloud-based platforms to our multinational customers across a global footprint. We are pressing ahead with restructuring Global Services to make ourselves a more efficient competitor, particularly in Europe. We are also developing more digital solutions for our customers and during the quarter we launched Agile Connect, a new software-defined wide area network service which is part of our dynamic network services. This gives customers greater control of their infrastructure as well as faster, simpler and more secure ways of setting up new sites. In 2016/17 we reported that we had identified inappropriate behaviour and improper accounting practices in our Italian business. We commenced a programme of remediation activities some of which were completed during 2016/17 with others running into the current year and beyond. During the half year we continued to take steps to improve the control environment in our Italian business but recognise that we have further activities to complete during the second half of the year including the assessment of our internal controls over financial reporting as of 31 March 2018 for the purposes of the US Sarbanes-Oxley Act 2002. We are also working to complete the local statutory accounts of BT Italia for 2016/17. We have settled £130m in compensation payments to other CPs in the half year. Compensation payments to the remaining CPs are currently being finalised. We continue to estimate the total compensation payments will amount to £300m. In March 2017 we announced we had reached agreement with Ofcom in respect of its strategic review of the digital communications industry. This agreement will see Openreach become a distinct, legally separate company within the BT group. In July 2017 Ofcom confirmed its decision to release BT from the Undertakings once the new Commitments are fully in place. We have already refreshed the Openreach brand and made progress on implementing the Openreach governance framework, and the new Openreach board under Mike McTighe is providing strong, independent leadership. Completing the reforms will depend on satisfaction of a number of conditions, including those relating to the Government amending the Crown Guarantee for the BT Pension Scheme and transferring employees to a distinct company, Openreach Limited. On 14 September 2017 Ofcom issued a further consultation on the WLA charge control in the light of stakeholder comments on the first consultation published in March 2017. Ofcom’s new proposals include slight changes to the charge control for 40/10 generic Ethernet access (GEA) service and for the metallic path facility (MPF) service. It also contains revised proposals on quality of service. In a separate consultation issued on 9 August 2017, Ofcom proposed a mechanism to spread the cost of our universal broadband commitment across all broadband lines, should Government accept our offer. We continue to engage with Ofcom, building on our response to the initial consultation, to ensure that modelling assumptions and methodologies used to set any controls over the prices we charge in the WLA markets allow our investments to earn a fair return and reflect the costs of improved service delivery. We expect Ofcom to issue a final statement containing its proposals in early 2018, with those proposals to take effect from April 2018, and remain in place until March 2021. There is no change to our financial outlook for 2017/18. Our strategy aims to deliver sustainable profitable revenue growth. Our first priority for the allocation of free cash flow is value-enhancing re-investment in our business to drive long-term profitable growth. This creates long-term value for our shareholders, strengthens the pension fund covenant, and supports the development of products and services our customers can value and use to grow their businesses. Cash flow after investment is available to support the pension, fund our progressive dividend and maintain a strong balance sheet. From next year, 2018/19, the interim dividend per share will be fixed at 30% of the prior year’s full year dividend per share. However, in this transitional year, 2017/18, we have decided to hold our interim dividend at 4.85 pence per share. Our progressive dividend policy remains unchanged; to maintain or grow the dividend each year whilst reflecting a number of factors including underlying medium term earnings expectations and levels of business reinvestment. The interim dividend will be paid on 5 February 2018 to shareholders on the register on 29 December 2017. The ex-dividend date is 28 December 2017. The election date for participation in BT’s Dividend Investment Plan in respect of this dividend is 29 December 2017. The final dividend for the year to 31 March 2017 of 10.55p, amounting to £1,050m, was approved at the Annual General Meeting on 12 July 2017 and paid on 4 September 2017. We will report our financial statements under IFRS 15 from the first quarter of 2018/19. We now expect to adopt IFRS 15 on a modified retrospective basis in our 2018/19 financial statements. Accordingly we will not restate prior year comparatives for the effect of IFRS 15 but will instead restate our 1 April 2018 opening reserves for the full cumulative impact of adopting this standard. We will provide a reconciliation of our primary financial statements under IAS 18 to our primary financial statements under IFRS 15 in our Annual Report & Form 20-F 2019. We intend to provide detailed analysis of the expected impact of IFRS 15 including proforma restated results for prior quarters by business during Q1 2018/19. At the same time as making changes to our quarterly reporting, we intend to refresh the operational KPIs that we provide including combined KPIs for the new Consumer division. This will simplify and better align them to the internal metrics that we use to manage the business, and therefore improve visibility of the drivers of BT’s operational performance. From the first quarter in 2018/19, we intend to move away from full quarterly reporting at the first and third quarter, and will instead provide quarterly trading statements. The trading statements will continue to contain sufficient financial and operational KPIs to allow investors and analysts to understand the drivers of our business including revenue and EBITDA by line of business. We will maintain full reporting for the half and full year reports. We also plan to introduce a series of business briefings to provide the market with a better understanding of the strategy and operations of our individual businesses. We intend to start this programme in the first quarter of 2018/19. Reported revenue was down 1% to £5,949m. This includes a £35m favourable impact from foreign exchange movements and a £40m reduction in transit revenue. Underlying1 revenue excluding transit was down 1.5%. Reported operating costs of £5,099m were down 1%. Adjusted1 operating costs, before depreciation and amortisation, of £4,140m were down 1%, reflecting the increased pension costs, business rates, sports programme rights and increased customer investment offset by reduced payments to other telecoms operators and cost savings. This includes a £33m adverse impact from foreign exchange movements and a £40m decrease in transit costs. Underlying1 operating costs excluding transit were down 0.3%. Adjusted1 EBITDA of £1,811m was down 4% and underlying1 EBITDA was down 4.1%. Depreciation and amortisation of £892m was up 3%. Reported net finance expense was £184m while adjusted1 net finance expense was £130m. Specific items1 resulted in a net charge before tax of £123m (Q2 2016/17: £202m) and after tax of £104m (Q2 2016/17: £151m). The main components include restructuring costs of £52m (Q2 2016/17: £nil) and the net interest expense on pensions of £54m (Q2 2016/17: £53m). Further detail on specific items is set out in note 4 to the condensed consolidated financial statements. Reported profit before tax was down 1% at £666m. Adjusted1 profit before tax was down 10% at £789m. The effective tax rate on profit before specific items was 20.4% (Q2 2016/17: 17.9%), with the rate being higher than the standard UK corporation tax rate (19%) principally due to higher overseas tax rates and disallowable costs. Reported EPS was 5.3p, down 7%. Adjusted1 EPS of 6.4p was down 11%. These are based on a weighted average number of shares in issue of 9,893m (Q2 2016/17: 9,932m). Capital expenditure was £858m (Q2 2016/17: £803m). This consists of gross expenditure of £897m (Q2 2016/17: £816m) which has been reduced by net grant funding of £39m (Q2 2016/17: £13m) mainly relating to our activity on the Broadband Delivery UK (BDUK) programme. The capital expenditure increase of £55m was primarily a result of increased investment in our fixed and mobile networks which was up £44m at £367m. Other capital expenditure components were up £11m with £323m spent on customer driven investments and £150m on systems and IT. Our base-case assumption for take-up in BDUK areas remains at 39% of total homes passed. Under the terms of the BDUK programme, we have a potential obligation to either re-invest or repay grant funding depending on factors including the level of customer take-up achieved. While we have recognised gross grant funding of £52m (Q2 2016/17: £34m) in line with network build in the quarter, we have also deferred £13m (Q2 2016/17: £21m) of the total grant funding to reflect higher take-up levels on a number of contracts. To date we have deferred £477m (Q2 2016/17: £292m). Net cash inflow from operating activities was down £464m at £1,270m. Normalised free cash flow1 was down £205m at £689m. The decrease primarily reflects working capital phasing and higher capital expenditure. A reconciliation to our free cash flow is shown in Additional Information on page 36. The net cash cost of specific items was £382m (Q2 2016/17: £62m). This includes payments related to the settlement of warranty claims under the 2015 EE acquisition agreement of £225m (Q2 2016/17: £nil), regulatory payments of £83m (Q2 2016/17: £nil), restructuring payments of £46m (Q2 2016/17: £10m) and EE integration cost payments of £20m (Q2 2016/17: £15m). After specific items and a £14m (Q2 2016/17: £44m) cash tax benefit from pension deficit payments, free cash was an inflow of £321m (Q2 2016/17: £876m). Net debt1 was £9,520m at 30 September 2017, £710m higher than at 30 June 2017. The increase in the quarter reflects dividends paid of £1.0bn, £21m for the buyback of 7m shares and £5m of pension deficit payments offset by proceeds of £46m from the exercise of all-employee share options. The IAS 19 net pension position at 30 September 2017 was a deficit of £7.7bn net of tax (£9.3bn gross of tax), compared with £8.0bn net of tax (£9.6bn gross of tax) at 30 June 2017. The fall in the deficit reflects a fall in the liabilities (driven by an increase in the discount rate), partly offset by a fall in the assets. The triennial valuation is proceeding and constructive discussions continue with the BT Pension Scheme (BTPS) Trustee. We are considering a number of funding options to address the deficit, including arrangements that would give the BTPS a prior claim over certain BT assets. We still expect to complete the triennial valuation in the first half of the 2018 calendar year. We continue to review the future pension benefits under our main defined benefit and defined contribution schemes in the UK, with the objective of providing fair, flexible and affordable pensions. Discussions with our unions are continuing and we expect to undertake a 60-day consultation with our affected employees shortly. A court hearing will also take place in early December to determine the appropriate approach for the future indexation of benefits for members of Section C of the BTPS. Reported revenue was flat at £11,786m. This includes a £136m favourable impact from foreign exchange movements and a £67m reduction in transit revenue. Underlying revenue1 excluding transit was down 0.7%. Reported operating costs of £10,334m were up 4%. Adjusted1 operating costs, before depreciation and amortisation, of £8,204m were up 1% reflecting the increased pension costs, business rates, sports rights and increased customer investment partly offset by reduced payments to other telecoms operators and cost savings. This includes a £120m adverse impact from foreign exchange movements and a £66m decrease in transit costs. Underlying1 operating costs excluding transit were up 0.6%. Adjusted1 EBITDA of £3,596m was down 3% and underlying1 EBITDA was down 3.3%. Depreciation and amortisation of £1,757m was up 2%. Reported net finance expense was £368m while adjusted1 net finance expense was £259m. Specific items1 resulted in a net charge before tax of £496m (HY 2016/17: £287m) and after tax of £450m (HY 2016/17: £221m). The main components include the settlement of warranty claims arising under the 2015 EE acquisition agreement of £225m (HY 2016/17: £nil), restructuring costs of £104m (HY 2016/17: £nil) and the net interest expense on pensions of £109m (HY 2016/17: £105m). Further detail on specific items is set out in note 4 to the condensed consolidated financial statements. Reported profit before tax was down 22% at £1,084m, due principally to the £496m specific item charge in the half year. Adjusted1 profit before tax decreased 6% to £1,580m. The effective tax rate on profit before specific items was 20.3% (HY 2016/17: 17.9%), The Finance (No.2) Act 2017, published in September 2017, was substantively enacted on 31 October 2017. This Act contains provisions that defer relief for brought forward losses. If this Act had been substantively enacted as at 30 September 2017, the effect would have been a decrease to the deferred tax liability of £33m and an equal and opposite increase to the corporation tax creditor. Reported EPS was 8.2p, down 29%. Adjusted1 EPS of 12.7p was down 8%. These are based on a weighted average number of shares in issue of 9,915m (HY 2016/17: 9,933m). Capital expenditure was £1,693m (HY 2016/17: £1,580m). This consists of gross expenditure of £1,739m (HY 2016/17: £1,620m) which has been reduced by net grant funding of £46m (HY 2016/17: £40m) mainly relating to our activity on the Broadband Delivery UK (BDUK) programme. The capital expenditure increase of £113m was primarily a result of increased investment in our fixed and mobile networks which was up £99m at £740m. Other capital expenditure components were up £14m with £627m spent on customer driven investments and £292m on systems and IT. Net cash inflow from operating activities was down £483m at £2,585m. Normalised free cash flow1 was down £97m at £1,245m. The decrease primarily reflects working capital phasing and higher capital expenditure. A reconciliation to our free cash flow is shown in Additional Information on page 36. The net cash cost of specific items was £589m (HY 2016/17: £114m). This includes payments related to the settlement of warranty claims arising from the 2015 acquisition agreement for EE of £225m (HY 2016/17: £nil), regulatory payments of £197m (HY 2016/17: £nil), restructuring of £81m (HY 2016/17: £29m) and EE integration cost payments of £30m (HY 2016/17: £33m). After specific items and a £28m (HY 2016/17: £88m) cash tax benefit from pension deficit payments, free cash was an inflow of £684m (HY 2016/17: £1,316m). Net debt1 was £9,520m at 30 September 2017, £588m higher than at 31 March 2017. The increase in the year reflects dividends paid of £1.0bn, £221m for the buyback of 76m shares and £10m of pension deficit payments offset by proceeds of £46m from the exercise of all-employee share options. At 30 September 2017 the group held cash and current investment balances of £2.9bn. We repaid a £0.5bn bond on 23 June 2017. Short term borrowings of £1.6bn include term debt of £0.9bn repayable during the remainder of 2017/18 and £0.6bn comprises both collateral for open mark to market positions and overdrafts. On 23 June 2017 we issued term debt of £2,025m (€2,300m) on the medium-term Euro market. The effective Sterling interest rates on these 5, 7 and 10 year bonds was 1.66%, 2.01% and 2.50%, respectively. During the period we cancelled our £1.5bn committed facility. This facility provided us with a bridge to capital market issuance and was cancelled in June 2017 when we issued the new Euro bonds. Our £2.1bn facility with 14 high quality syndicate banks (£150m each) remains undrawn at 30 September 2017. This facility matures in September 2021. A summary of the Group’s principal risks and uncertainties is provided in note 11. Revenue was up 1% driven by an increase in Calls, Lines, Broadband, TV and Sport revenue. 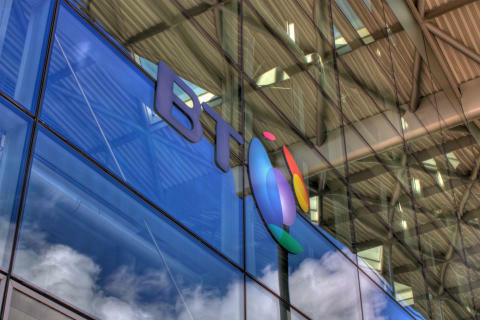 BT Consumer 12-month rolling ARPU increased 6% to £41 per month. Revenue generating units per customer1 grew 3% to 2.01. Across BT, superfast fibre broadband growth continued with 179,000 net additions, taking our customer base to 5.3m. Of our broadband customers, 57% are now on fibre. We added 22,000 broadband customers this quarter, representing 34% of the DSL and fibre broadband market net additions. 85% of our calls are answered in the UK compared to 58% at the same time last year, and average call waiting times are currently 74 seconds which is almost 4 minutes faster than last year. We are pleased to note that Ofcom’s complaints data shows a reduction of 25% for landlines and 18% for broadband when compared to the previous quarter. We launched the new BT TV app which is free to all BT TV customers, with many great features including access to premium BT TV channels and allowing you to set recordings on the move. Operating costs increased 2% due to the investment in new UK customer service roles and additional sports rights costs from Premier League, Box Nation and the Ashes uplift in our Cricket Australia deal. As a result EBITDA was down 3% in the quarter. Depreciation and amortisation was up 4% and operating profit was down 5% for the quarter. We have continued to invest in our broadband capabilities to support the ongoing growth of fibre and increased bandwidth requirements to reduce peak time congestion. This led to a 40% increase in capital expenditure. Normalised free cash flow reduced 74% reflecting this capital expenditure along with adverse working capital movements that we expect to unwind. Revenue was up 4% with a 6% increase in postpaid revenue and a 12% increase in fixed broadband revenues, partially offset by a 12% reduction in prepaid revenue. This is the fourth consecutive quarter of revenue growth, mainly due to our ‘more for more’ pricing strategy, with new and upgrading customers increasing their spending with us in return for bigger bundles of usage, exclusive content and better smartphones. 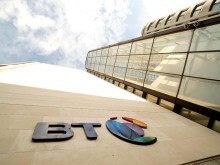 At the end of the quarter, the total BT mobile base was 29.7m. We added 279,000 postpaid mobile customers, taking the postpaid base to 17.3m. Group postpaid churn was 1.2% reflecting a continuing high level of customer loyalty. Our prepaid customers fell by 260,000, in line with industry trends, taking the base to 6.3m. Our 4G customer base reached 19.4m. Monthly mobile ARPU was £20.9, up 9%, reflecting an average of £26.8 for postpaid customers, up 2% and £4.8 for prepaid customers, up 8%, across the Group. In September we delivered the Home Office requirements to achieve the latest major milestone in the Emergency Services Network (ESN) contract. Our 4G geographic coverage now reaches 86% of the UK’s landmass and we continue to work towards 95% coverage by the end of December 2020. EE was recognised as the best overall network in the latest OpenSignal report, and won Best Network in the Mobile Choice awards for the fifth year in a row. EE was the exclusive UK network to launch the new Apple Watch Series 3 with cellular connectivity. Operating costs were £1,000m in the quarter, resulting in EBITDA of £326m. EBITDA was up 16%, driven by revenue growth in the quarter and reduced indirect costs. This increase was partially offset by increased customer investment costs, which are expected to accelerate in the second half of the year, driven by new smartphone launches. Depreciation and amortisation was £189m and operating profit was £137m for the quarter. Capital expenditure was £155m in the quarter up 4% as network investment increased. Normalised free cash flow was £89m higher, reflecting the increase in EBITDA and favourable working capital movements which we expect to reverse next quarter. Revenue decreased 2% and underlying revenue excluding transit was down 1%, due to the decline in traditional lines as the market shifts to data and IP, offset by continued strong mobile and networking growth. SME revenue was flat, with growth in mobile, VoIP and networking offsetting the decline in lines. Corporate revenue was also flat with strong growth in mobile offsetting the decline in lines. Public Sector and Major Business revenue was down 5%, with growth in mobile more than offset by lower equipment sales. Foreign exchange movements had a £5m positive impact on Republic of Ireland revenue, where underlying revenue excluding transit was down 11%, due to the impact of churn on traditional lines and lower equipment sales. Order intake decreased 14% to £0.7bn compared to the same quarter last year and was up 22% to £3.8bn on a rolling 12-month basis, due to the signing of a large wholesale contract in the Republic of Ireland in Q1. Deals signed in the first half of the year include an agreement with Severn Trent Water to provide their core communications infrastructure including Managed WAN, Voice, SIP and LAN services. BT has been chosen by FirstGroup Plc as their preferred Mobility Partner to provide a full range of Mobility Services across their business. We have signed a significant multi-million pound contract with the London Borough of Bromley which will see BT taking responsibility for all of the Council’s IT services and will involve the provision of new data and voice networks, mobile phones, internet access and support for business software applications to support more than 2,000 Council workers. Operating costs were 1% higher and EBITDA declined 7% driven by the reduction in revenue. Depreciation and amortisation increased 10% and operating profit was 13% lower. Capital expenditure increased £27m largely due to higher spend in customer contracts and normalised free cash flow was £36m lower reflecting the increased capital expenditure and £29m decrease in EBITDA, offset by the timing of working capital movements. Revenue for the quarter was down 10% including a £30m positive impact from foreign exchange movements whilst transit revenue was down £32m. Underlying revenue excluding transit was down 11%, and excluding the revenue of our Italian business was down 8%. This underlying revenue decline reflects lower IP Exchange volumes and equipment sales in the UK, in line with our strategy to reduce low margin business, the ongoing impact of a major customer insourcing services in the US, a large contract in Brazil that has now completed and lower general trading across all of our regions. In the UK underlying revenue excluding transit was down 8%. In Continental Europe underlying revenue excluding transit was down 14%, and excluding the revenue of our Italian business was down 3%. In the Americas1 underlying revenue was down 14% while in AMEA2 underlying revenue was down 5%. Our total order intake was £0.9bn in the quarter, down 38% and on a rolling 12-month basis was £3.9bn, down 25% year on year, due to a number of large contracts in the prior year and ongoing challenging market conditions. During the quarter we launched Agile Connect, a new software-defined wide area network (SD-WAN) service providing customers with greater control of their infrastructure as well as a faster, simpler and more secure way of setting up new sites. We further expanded our existing Security Operations Centre (SOC) in Sydney by opening a global cyber security research and development hub. Operating costs were down 8% mainly reflecting the impact of lower revenue. EBITDA was down 39% for the quarter, and excluding the results of our Italian business was down 28% due to a combination of trading and increased pension and leaver costs. Depreciation and amortisation was up 6% due to the timing of recognition on certain projects. Operating loss for the quarter was £34m. Capital expenditure was down 41% for the quarter primarily due to the timing of project-related expenditure which we expect to partially reverse in the second half of the year. Normalised free cash flow was an inflow of £46m. Revenue was down 3% with underlying revenue excluding transit also down 3%. Managed solutions revenue was down 8% primarily due to continued lower revenue from our Mobile Ethernet Access Services contracts, reflecting the maturity of mobile network operator 4G build out programmes. Data and Broadband revenue was down 8% due to the continuing decline in legacy Partial Private Circuits. This was a sharper decline than in Q1 because Q2 last year benefitted from higher connections revenue in Optical. Voice revenue was down 3%. Our Ventures business generated revenue of £80m. This was down 2% mainly due to decline in our Phonebook business partially offset by growth in bulk messaging services, Supply Chain and Fleet Solutions. Mobile generated revenue of £60m, up 11% helped by increased data usage by MVNO customers. In Ventures 26 InLinkUK units were live at the end of the quarter, and we are encouraged by the digital advertising revenue we earn from these. We are also very pleased that our media and broadcast division won an Emmy Award for the way we connect television companies to the BT Tower to distribute live footage. Order intake of £372m was up 16% on last year, but up 117% on Q1 reflecting the expected slippage of some deals from Q1 to Q2. On a rolling 12-month basis order intake is £1.8bn, up 32% year on year. Operating costs were broadly flat and EBITDA decreased 8% reflecting the revenue decline, particularly in higher margin legacy services. The EBITDA performance was slightly below our expectations reflecting the competitive dynamics of the data and broadband markets. For the quarter, depreciation and amortisation was up 4%, and operating profit decreased 16%. Capital expenditure was up 8%. Normalised free cash flow was £120m, down 23% on last year reflecting lower EBITDA and timing on working capital. Revenue was up 1% with growth of 21% in fibre broadband and 2% for our Ethernet products offsetting an ongoing reduction in the copper line base. This growth includes regulatory price changes which had a negative impact of around £13m and commercial price changes which had a negative impact of around £14m. We continue to extend the reach of fibre broadband which is now available to more than 27.1m premises of which around 770,000 can order an ultrafast (100Mbps+) service via our FTTP or G.fast technologies. We now have around 8.6m customers connected to fibre which is around 32% of those passed. We continue to focus on improving the experience of our customers. Year to date we are ahead on all 60 copper minimum service levels set by Ofcom and have seen a 2% reduction in our copper network faults compared to the first half of last year. Openreach’s consultation with Communication Providers on the investment case for a large-scale FTTP broadband network across the UK indicated broad support for this proposition. However, for the investment to be economically viable, a number of key enablers will need to be put in place through close co-operation between Openreach, CPs, Ofcom and Government. The enablers include: a supportive policy and regulatory environment that encourages investment; FTTP switchover; agreeing how investment costs can be fairly recovered; and Openreach demonstrating that it can build FTTP at scale for a competitive cost. We plan to invite views from CPs on a more specific set of proposals that cover potential pricing, footprint and a plan for FTTP switchover, by the end of the year. Further details can be found in our press release dated 31 October 2017. Operating costs were 2% higher mainly driven by an increase in business rates charged on network assets and higher pension charges that were partly offset by lower service level guarantee payments as a result of clearing our aged Ethernet tail. EBITDA was down 1% and depreciation and amortisation was up 4% with operating profit down 7%. Capital expenditure was £397m, up £40m or 11%, reflecting our ongoing investment in fibre broadband coverage and speed, and delivering a higher volume of Ethernet connections. Capital expenditure includes gross grant funding of £50m (Q2 2016/17: £34m) directly related to our activity on the BDUK programme build which was offset by the deferral of £12m of grant funding (Q2 2016/17: £21m). Under the terms of the BDUK programme we have a potential obligation to either re-invest or repay grant funding depending on factors including the level of customer take-up achieved. Normalised free cash flow was down 60% due to timing of customer cash receipts and higher capital investment.